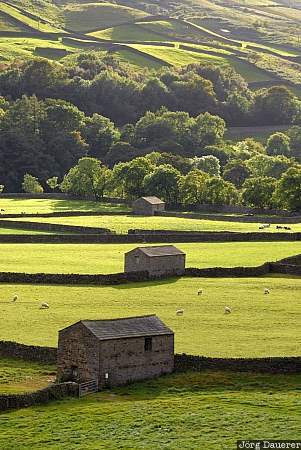 A barn and drystone walls in the green meadows of Swaledale in the northern part of the Yorkshire Dales, Yorkshire, United Kingdom. This photo was taken in the evening of a sunny day in September of 2007. This photo is part of the exhibition The color Green (February 2009). This photo was taken with a digital camera.